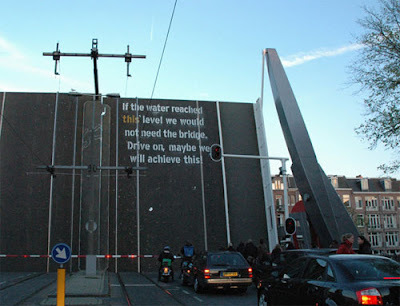 Very clever ambient ad from Amsterdam promoting the need to re-evaluate our lifestyles*. This is extremely impactful and from an advertising perspective it is a great example of how the media execution can enhance the message. I have been talking recently about how bringing media further forward in the creative process can produce better digital advertising and have quoted examples like BA integrating Google Earth into their ad creative and Nike Run London mashing up Google Maps. The above ambient example is a good reminder that the same rule works with 'traditional channels too' - a strong message is significantly amplified by the context of the execution. *Thank you to the Beam blog for highlighting this and to the Wooster Collective for posting it.